On a Saturday afternoon in February at Western Tennis and Fitness Club in Green Township, Rachel Fair and Tony Pack are coaching 13 area African-American and Hispanic youngsters through the basics of tennis. The kids range in age and size, some less prepared than others to spend two hours on the courts—including the adolescent girl rocking her Ugg-style boots—but each receives instruction suited to their individual skill level. It’s a small group compared to what Fair and Pack will see at their daily outdoor summer program in a few months, which draws several times this number. Think about commitments that span 30 years. For marriages, it’s impressive. For mortgages, it’s standard in contract, yet rare in practice. And for employee-company relationships, it’s almost unheard of anymore. Which is why three decades as the volunteer founders and directors of the Inner City Tennis Project (ICTP) puts Fair and Pack in rarefied air. Since 1986, they’ve haunted area courts like those at Western, coaching local kids—many of whom have never held a racquet—on the game of tennis, but also mentoring them on life in general, regularly chatting about things like school and fitness after each session. “We want to expand their horizons,” says Fair. “Give them opportunities to experience the side of sports they wouldn’t otherwise be able to.” Like traveling for a tournament, or meeting other players from different backgrounds. Fair and Pack met in the mid 1970s while working together for the Cincinnati Recreation Commission (CRC), which for decades has conducted a summer youth tennis program through the United States Tennis Association. Both were beyond qualified to coach. Fair picked up tennis growing up in Cleveland in the mid 1950s and competed in a youth league run by the American Tennis Association, which formed in 1916 when blacks were barred from white tennis programs. Pack, a 1970 graduate of Woodward High School and later the University of Cincinnati, started hitting balls with his father when he was only 5 years old. “The racquet was bigger than me,” he remembers. “My dad cut the handle in half.” In 1991, he became a men’s singles champ at the Colonial Racquet Club Championship. They had to be resourceful early on. When they started indoor sessions in Avondale’s Hirsch Recreation Center gym that fall, Pack used a portable net and taped down a tennis court outline on the basketball floor. The summer sessions soon found a home on the outdoor CRC courts at Losantiville Triangle in Clifton, where they’ve remained for the past 25 years. 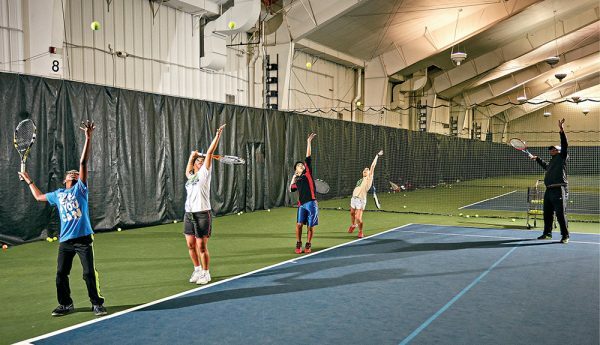 But they shuffled through a number of indoor spots—an Over-the-Rhine community center, Colonial Racquet & Fitness Club, Queen City Racquet and Fitness Club—before landing at Western’s tennis club in 2015. Still, the program has developed gradually. After starting with Pack’s daughter and Fair’s nephews the first year, it grew to 36 kids by the third summer. And it got results. “Our kids were coming out of a gymnasium, playing against ‘club’ kids, and winning tournaments,” says Pack. Tennis is the draw, the focal point, but Fair and Pack also use it as a surface they can varnish with various skills and values. In addition to daily lessons, kids get counseled on fitness and healthy eating by a visiting nutritionist. In recent years, ICTP has also offered an additional “day camp” option, during which participants take buses around town to foster independence, and visit the Pleasant Ridge Community Center on rainy days or to go swimming. They receive tutoring from University of Cincinnati students, participate in the public library’s summer reading programs, and may even be asked to submit an essay on an inspiring person they’ve read about. It’s a bargain, too: $60 per week for full-day camp, $40 a week for half days. When at home, all players are instructed to practice tennis swings and serve tosses—“There’s a thing called muscle memory,” Pack reminds the players. The serious ones are also expected to enter tournaments, such as the American Tennis Association tournament in Indianapolis each July, to test and hone their skills. It’s an ambitious agenda, but an effective one. In 30 years, Fair says they’ve only had to dismiss two kids. Maineville resident Amber Pipkins grew up in North Avondale and joined ICTP at 8 years old. At first, her mother would stay and watch practices, making sure it was a positive environment. It didn’t take long to realize her daughter was in good hands. She got one. After competing on the tennis team at Walnut Hills High School (where she graduated in 1998), she earned a scholarship to Florida A&M University, playing singles and doubles for the women’s tennis team—one of many to benefit from Fair and Pack and their commitment to the sport and the community. Over the past three decades, nearly 90 past ICTP participants have landed tennis or academic scholarships. Today, Pipkins is a senior market research analyst for Cintas Corporation, where she was hired out of college and has worked for the past 13 years. She’s also one of 14 ICTP board members, many of whom have a tennis background or specific interest in child welfare or health. The group—which also includes an attorney, a doctor, a retired teacher, and banking and sales executives—helm the group’s ever-developing outreach and assist with fund-raising and other finances. Last year’s $30,000 budget covered six months of (discounted) indoor court time, a new ball machine, and equipment, all of it cobbled together through money earned from the summer camps and events such as the annual fund-raiser tournament organized by Kenwood Country Club each September. They also receive donations from the charity arm of the Western & Southern Open tournament, the Cincinnati chapter of Links, Inc., and the Center for Closing the Health Gap; the latter, run by former Cincinnati mayor Dwight Tillery, donated $2,500 and provides the nutritionist visits. His office isn’t far from the outdoor Triangle courts, so he often drives past in-progress lessons during the summer to catch a glimpse of Fair and Pack hard at work alongside their much-younger players. “It’s really impressive to see them out there, in July, when it’s 90 degrees,” he says. It’s also evidence of the challenges facing the Inner City Tennis Project moving forward. The organization would love to do more, like build their own indoor facility and expand their blend of tennis and life lessons to other nearby areas with children in need. But it’s tough. Tennis is an expensive sport. (As the lessons move indoors, they are offered by invitation only, and participants have to cover a portion of the cost.) The program is already working on a shoestring budget, with a volunteer staff (minus some part-time summer help), led by two tireless, dedicated instructors who are rapidly approaching retirement. Fair and Pack clearly care far too much to simply walk away—“You don’t turn your children over to just anyone,” says Pack—but their ardent generosity can’t last forever. Fair, who is 74—though you wouldn’t know it to watch her nimbly haul equipment bags in and out of facilities—would love to have time to do some traveling. Pack, 64, uses a walker to get around following his hip surgery a few years ago. He figured he’d retire when his daughter turned 18. “She’s 37 now, and I’m still here,” he chuckles. As ICTP pushes forward into the future, replicating that generosity will be most important, beyond landing a facility or even skilled instructors. Plenty of people can coach a good forehand, but fewer can do so with a loftier goal in mind. “We’ve got to find people who have the same values [as Fair and Pack], and can carry on the legacy,” says Pipkins. Back on the Western courts, near the end of that late-winter session, Pack’s tough-cop approach is paying off. “You’re so good when you listen to me. I’m smilin’!” he shouts to one of the older boys after an impressive shot. “Yeah, that’s what I’m talkin’ about!” he tells another. He then shifts to watch Dolores, a seventh-grader, as she sets to return a strong serve, deftly smacking the ball past her opponent’s futile forehand, much to Pack’s delight. Her attempt to coolly accept the praise being heaped from the sideline starts out strong, but she can’t help herself, finally turning away with a grin and indulging in a well-earned fist pump. Next articleLetter From Katie: Still Nights at the Marjorie P.